The other day, I went to make some apple chutney, when lo and behold, I realized that we were completely out of brown sugar. Now, in my mind, brown sugar is absolutely necessary for this kind of thing, so needless to say I was at my wits end. Until I remembered something. Somewhere, in the back of my mind I recalled learning that brown sugar is really just a mixture of white sugar and molasses. So, having both of these ingredients on hand, I decided to whip up some brown sugar of my own. What I found was that not only was it incredibly simple to make my own brown sugar, but it was incredibly tasty too. Adding fresh molasses gave the sugar more of that sweet, slightly bitter molasses flavor - fantastic. I may never go back to the regular kind. Nor do I need to, not with how easy it is to make your own. Just scoop some white sugar into your food processor, add your molasses (I’d start with about 1 Tbsp for every cup of sugar), pulse for a few seconds, and presto, homemade brown sugar. You can add more molasses for darker sugar. I even tried making this with sorghum syrup in lieu of the molasses with equally delicious results. And so, using my wonderful homemade brown sugar, I decided to whip up lovely fall cake with pears and crystallized ginger. What I ended up with was the kind of cake you’d like to eat by a fire on a chilly fall evening with a hot mug of tea to go with it. Which sounds so good, I’m not even sure why I’m still writing and not doing exactly that. Nor am I sure why you’re still reading this, when you too could be well on your way to fall cake nirvana. I’ll see you there. 2. Combine the flour, sugar, salt and baking powder in a large bowl. 3. In another bowl or large measuring cup, combine the milk, eggs, and melted butter, whisking until fully combined. Pour into the flour mixture and stir to combine. 4. Add in the pears, ginger, and brandy. Mix until ingredients are evenly distributed, then pour into a greased loaf pan. 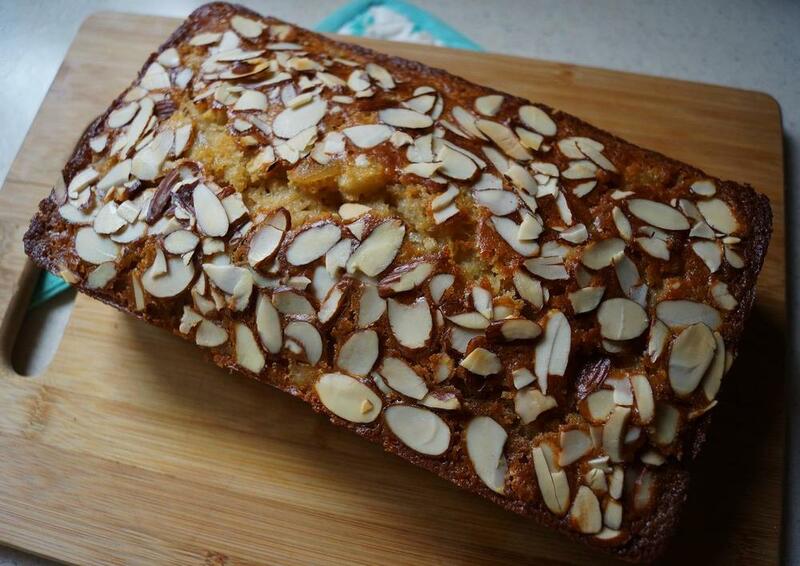 Sprinkle sliced almonds on top of batter in pan. 5. Bake at 350 degrees for 55-60 minutes, or until cake is golden and a toothpick inserted into the center of the cake comes out clean. Cool slightly, remove from pan, slice and serve.